Porg, the adorable kitten, was found abandoned in a box. But besides her unique rescue story, she also has a rare skin disorder called Elhers Danlos and most importantly, two incredibley huge glass eyes you will instantly fall in love with. Follow Porg oninstagram. 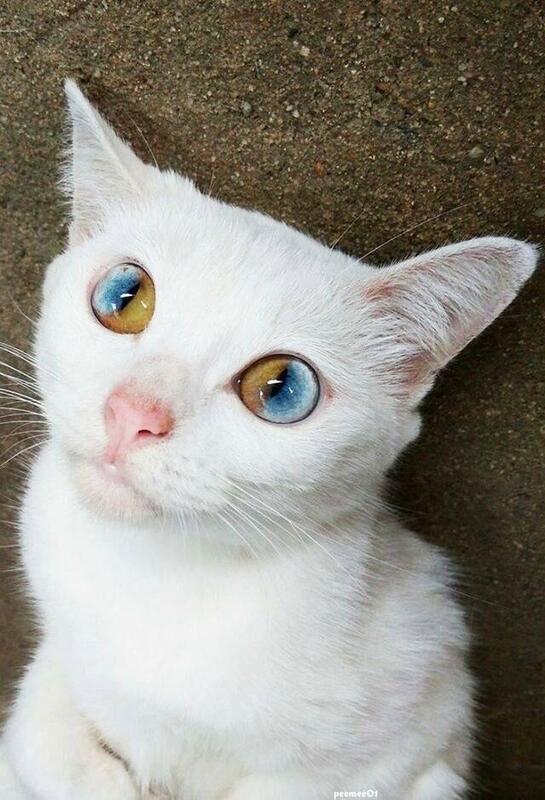 Have You Ever Seen Such Unique Eyes? Just admit it, goat eyes look a bit unusual! They're flatter and more elongated than ours and that actually might be a key towards their survival. A study out of the University of California, Berkeley looked at many different animal eyeballs and discovered a fascinating trend. Seven-year-old Madden Humphreys of Oklahoma was born with two rare conditions — a bilateral cleft lip and complete Heterochromia iridum, or different-colored eyes. And he hasn't had it easy. One cat that looks exactly like him changed his life forever. For more from Zelda the cat, visit her twitter page. Gimo The Cat Has The Biggest Eyes You’ve Ever Seen And It’s So Adorable! Get ready for a heavy load of cuteness in a form of kitty named Gimo the cat, which should be enough to keep the Internet running quite a while if you ask us. Scroll down the gallery and check out Gimo the cat in various adorable poses. Iriss & Abyss are two blond twin sisters with heterochromia – two different color eyes. They were born on 11.11.2015 in Saint-Petersburg, and they are the most beautiful cats we have ever seen. For more photos of this amazing duo, check out their popular Instagram page. Eyes as the window to evolution. You can learn quite a bit by studying how and why animals use their vision. Science writer, Ed Yong, wrote a fascinating article on National Geographic that explores the evolution of eye anatomy and examines the role that a creature's environment plays in the development of eye function and appearance. "The variety of tasks that eyes perform is limited only by the fecundity of nature," Yong writes. "They represent a collision between the constancy of physics and the messiness of biology." Yong's article was accompanied by incredible close-up images by photographer David Liittschwager that illustrate the diverse biology of various animal eyes. This is Pam Pam, the kitty with the most mesmerizing eyes ever. See for yourself below, but don't look at them for too long or you might never be able to look away again! He bears a striking resemblance to the Shrek star, right! ?